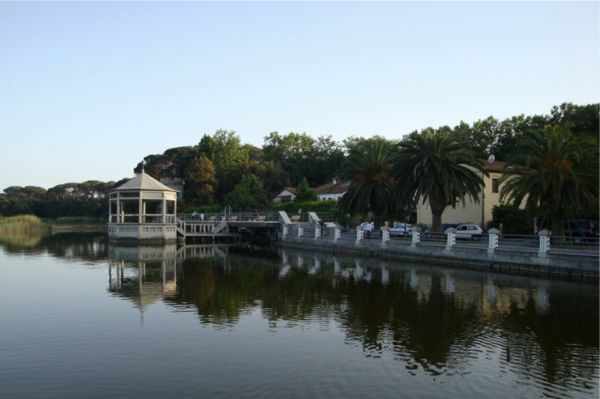 The impressive grand open-air theatre at Torre del Lago, with seating for more than 3,000 people and with the natural back – drop of Lake Massaciuccoli, is once more the venue for the Puccini Festival. 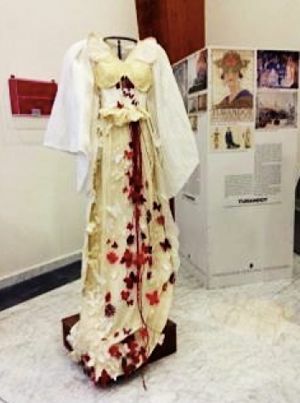 Now in it’s 60th year, one of the show pieces is a new production of Madama Butterfly, created by director and designer Renzo Giacchieri to celebrate the 110th anniversary of the work’s première in Milan in 1904. Giacchieri described his delight in returning to the enchanting Torre del Lago after a quarter of a century to direct this opera, in a new scenic space, but also with the knowledge that the master sleeps for eternity, only 100 metres away. Butterfly is essentially about love, betrayal and tragedy. The action takes place in Nagasaki, a Japanese port where Pinkerton, a lieutenant in the US navy meets and marries ‘Japanese style’ a young geisha girl, Cho-Cho-San or Butterfly. Japanese art and culture in all its simplicity was evident immediately in Giacchiere’s creative set design. The cut out at the back of the stage enabled the natural landscape behind bathed in its own natural light to become part of the scene and was both practical and beautiful. Butterfly is an intimate domestic tragedy and some purists would criticise a large-scale open-air production. However, Puccini’s sublime music – and there are many glorious moments – surely out weighs these arguments and in fact Giacchiere’s impressive set design, aimed at simplicity in the Japanese manner seems in itself to give that required feeling of intimacy. 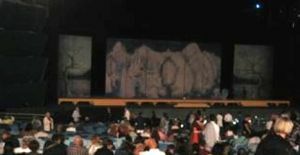 The interval after the first act is used to bring on several tall screens painted with Japanese scenes reminiscent of The Wave, Hokusai’s famous wood block print created in around 1832. They were used very effectively throughout the rest of the work and gave much flexibility to the set. Hokusai, whose art works were first exhibited in the West at the World Trade Fair in Paris in 1867 to great acclaim and whose wood block prints inspired great French artists like Monet, would be a natural starting point for any set designer of this work. Another influence, this time on costume and movement is that of the Kabuki theatre – traditional realistic Japanese theatre, which reemerged during the 19th century when Japan made closer ties with the Europe and the US in terms of trade and culture exchange. At this time, Pierre Loti, the French writer wrote one of his most famous novels, Madame Chrysanthème (1887) based on his encounter with a young Japanese woman and this together with John Luther Long’s short story, Madame Butterfly provided the basis for the libretto of what was to become one of the most often performed operas in the repertoire. These positive outcomes of East meets West provide a contrast to the fateful meeting between Pinkerton and Butterfly which begins well but ends ultimately in tragedy. Having attended last Friday’s performance, I was reminded why this opera has remained a firm favourite with audiences. There were some wonderful moments, both visually and musically, particularly in Act 11. Butterfly is waiting with her son for Pinkerton’s return, oblivious to the fact that he has betrayed her and is returning with his American bride to take his son away. The scene begins with quite subdued colours, even as Butterfly optimistically sings the famous and beautiful aria, One Fine day. Then cannon fire heralds the arrival of Pinkerton’s ship and Butterfly’s subsequent joy is immediate. A rather menacing looking row of male chorus walk onto the stage dressed in black and each turns towards a screen. Then in one slick, choreographed movement, the screens are pushed and turn to reveal brightly lit pink cherry blossom while at the same time, Butterfly throws off her outer garment and stands once more in her wedding dress. This piece of dramatic theatre was quite stunning and drew an audible gasp from the audience. Another striking example of both was the Humming Chorus scene. Butterfly lies down exhausted, stage front after her long vigil waiting for Pinkerton’s return. The lights are dimmed and the female chorus slowly line up behind her, some carrying large lanterns which provide the only lighting for the scene. Then, out into the still night they sing the beautiful Humming Chorus; the effect is both poignant and magical and also very moving. Josè Miguel Perez Sierra conducts the excellent orchestra while the title - role of Butterfly is performed on different nights by sopranos Michela Carosi, Amarilli Nizza and Silvana Froli. Pinkerton is sung by the talented young tenor, Rame Lahaj, who is making his debut in the role and there is a strong supporting cast. 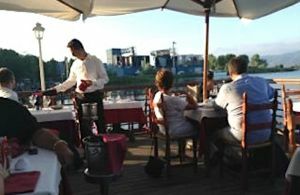 A magical night at the opera is only complete when preceded by a good dinner and my choice is always the restaurant on the lake with its romantic outlook. The food is good too! 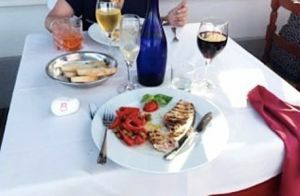 I chose a delicious fish dish with a glass of local Lucchese wine. 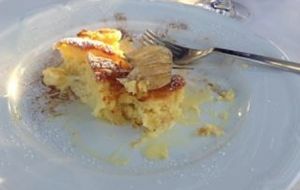 I couldn’t resist this dessert – a wonderful creamy torta. 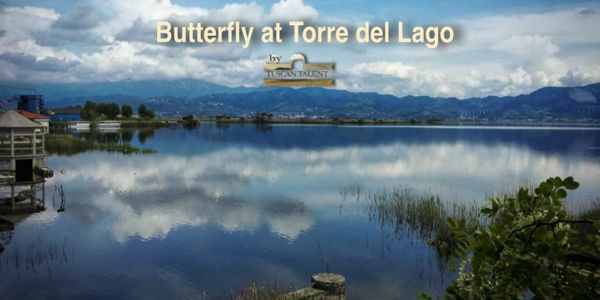 The Festival, which takes place a stone’s throw away from Puccini’s villa and mausoleum, is on until the end of August and is definitely worth a visit.